Hill Road mid 1940s. Take from junction of Hill Road/Southwell Road. The property that can just be seen, centre picture, is probably 'Durley Grange'. Photo taken fom Hill Road/Southwell Road in the late 1960s/early 1970s. 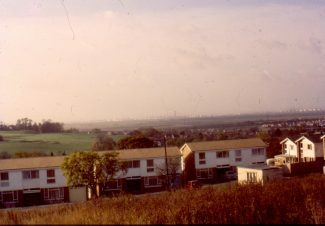 The chalet, lower centre in the picture stands on the corner of Hill Road/Fernlea Road. 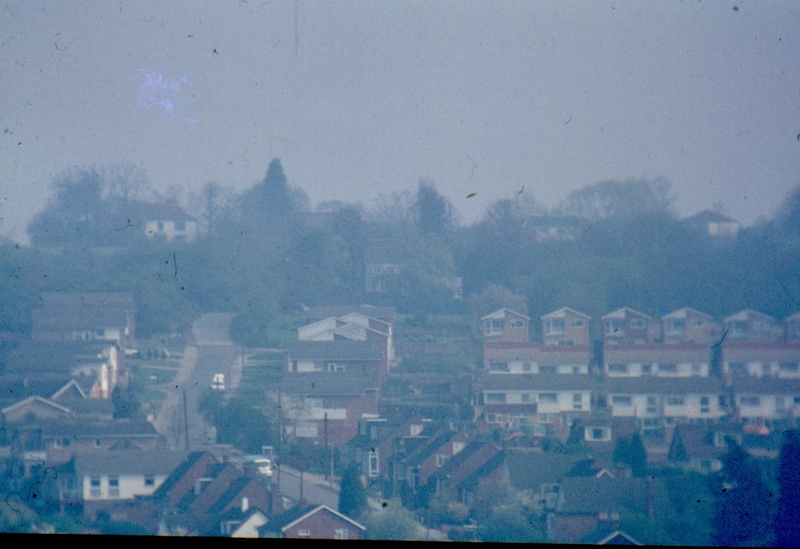 Photo taken from Hill Road/Southwell Road in the late 1970s. Corner of Lime Road looking down Hill Road. 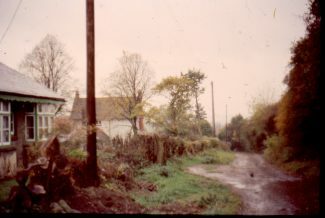 The entrance to the pig farm was immediately to the right of where the photo was taken from. 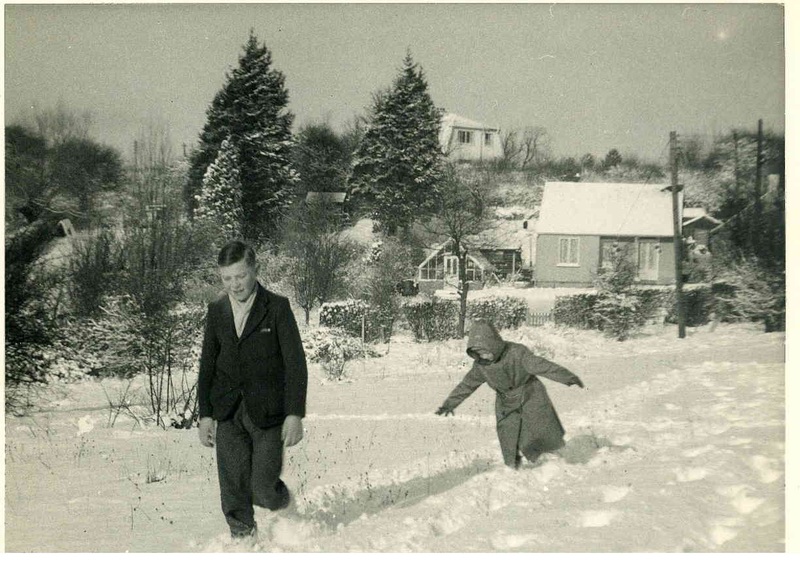 My brother Alan and me, probably taken in the late 50s, in the field opposite 'Lyndhurst'. Bob and Nell Wood's bungalow is in the background. 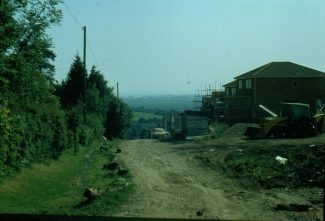 Photo taken late 1970s from the footpath on Boyce Hill Golf Course, looking up Hill Road. The white house top left is 'Jarvis Hall'. 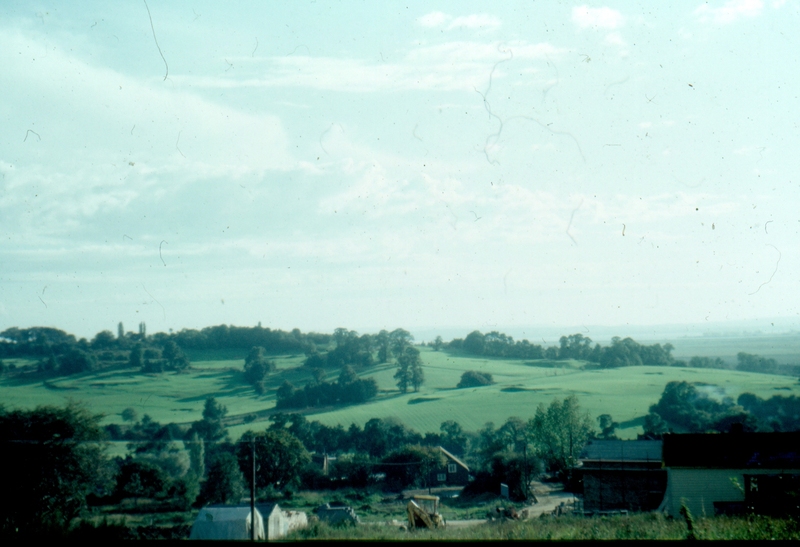 Taken early 1970s from the garden of 'The Chime' looking east. The property in the distance is 'Crescent House' located in Mount Crescent. 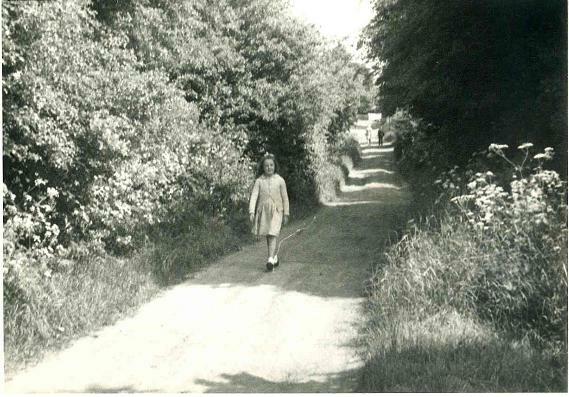 Hill Road, where I was born in the early 1950s, has seen many changes over the past half century. My father Harry and mother Jessie had lived there since the late 1940s. I was the youngest of their three children and had two older brothers. My father was a keen amateur photographer and often took his camera with him when walking his dog. After he died in the early 1980s I inherited his collection of local photographs, taken over a span of 50 years. 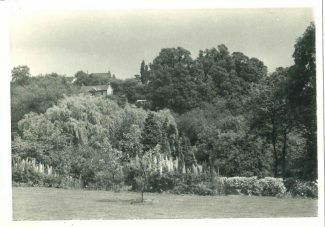 In the early 1950s there were just four properties at the top end of Hill Road and a handful at the lower end towards the junction with Underhill Road. ‘Lyndhurst’ was situated on the corner of Lime Road and Hill Road. There was no mains drainage to the bungalow and no electricity supply. The toilet was what we laughingly referred to as ‘bucket and chuck it’. The more able in my family, my father in the early years and later my two brothers, regularly had to empty the contents of the tin bucket into a large, deep hole within the grounds. Luckily, we had a big garden, around three quarters an acre. In spite of this my childhood was idyllic. The top end of Hill Road was unmade and remains so today. The ruts and mud and overgrown bushes made it difficult for car drivers, so very little traffic used the road. Luckily, this meant that my parents allowed me to roam freely and from a very early age, I would spend all my out of school time climbing trees and making dens in the thick woodlands. I remember my early childhood as being carefree and happy. At this time I attended Thundersley Primary School in Dark Lane, Thundersley. During the warmer months, when the evenings were longer I would go out to play until quite late, even as it grew dark it was still considered safe for me to be out alone. The field outside ‘Lyndhurst’ was partly fenced, allowing us to play there. We never knew who owned this land but there were horses tethered there during the summer months. When my friend Susan came to play we would take our butterfly nets and jam jars and chase butterflies through the long grass. In the summer it was a glorious sight, the whole area was covered with daisies and wild flowers growing up to waist height. My parents had friends who lived opposite this field on the boundary with Thundersley Park Road, Bob Wood and his wife Nell. Bob was a keen gardener and was always to be seen out front, mowing his lawn. Bob’s sister, Eva, lived next door to them. 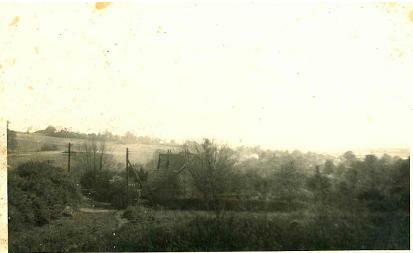 At the very top of Hill Road where it meets Thundersley Park Road was a house called ‘The Chime’. It was a very large and somehow frightening looking property. The Mills family lived there, mother and father and their daughter Betty. I don’t remember ever seeing Mr Mills, but I do remember if you asked after him you would always be told he was ‘resting’. The whole family smoked heavily and because they rarely ventured out, they would ask my mum to run errands for them, sometimes food but usually cigarettes and chocolate. When we came back with the shopping, Betty would always give me some of the chocolate. On the other side of ‘Lyndhurst’ heading down the hill was a property called ‘Aldecar’ where a family lived who were also friends of my parents and my dad would sometimes visit them and play on their piano. Next door to them lived the Hockley family, again occasionally we would visit them. Everyone, knew everyone in those days. This was the last house going down Hill Road before the long, open un-made section which gave way to a few more houses at the very bottom. Opposite ‘Aldecar’ was a wide, five bar wooden gate leading into a field, which then opened out into another large area where there was a pig farm. I remember playing with the pigs in their pens. I used to scrump apples from the trees in our garden and take them down to feed the animals. I can remember being afraid that the farmer would catch me and be angry. When the conditions were right, you could hear the pigs squeal at feeding time from our garden. Looking back I don’t think I understood what would eventually happen to them. A little further down Hill Road, standing all on its own amidst the fields was a colonial style bungalow. The property faced towards the golf course and had a white, wooden ornate veranda across the front, where the family sat down for afternoon tea. They were called the Allerman family and I would sometimes visit them with my mum. Mrs Allerman made wonderful cakes and on a Saturday it was a treat to visit them. The tea was served on the veranda and was a grand affair, with pretty china, damask tablecloths and best silver. I believe this property was called ‘Durley Grange’ and in the late 1960s it was sold to a property developer who went on to build many of the houses there today. The development was named ‘Durley Grange’ and the first road to be built was Clarence Road North. Over the next decade the whole development evolved, including Hill Road, Durley Close, Hill Close, Fernlea Road and Southwell Road. Bernard, having recently begun to delve into my family history, I have found that I do have a cousin Dorothy Emery and she lived at Tarpots in the 50s/60s. Not sure about Eddie, I will keep looking. Sorry Bernard, but I am unable to help you. I did have relatives in Tarpots at this time but their names were, John and Bella Emery. They had a son called Kenny (Kenneth) but as far as I know there was no Dorothy or Eddie. Perhaps one of our readers will see this and be able to help you. Do you know Eddie Emery or Dorothy Emery they were old friends of mine, I would like to get in touch with them. My father had the Clockhouse Cafe, South Benfleet, for many years, can you help me? I was born in Underhill Road in 1946 and lived there for most of my childhood. My maiden name was Webb and I was the granddaughter of the Bannister’s. I wonder if anyone remembers me? (Susan you were born there the year after me). I went to the village school for a year and then went to Lindisfarne in Westcliff. I remember walking up Hill Road past Durley Grange (or was it Jarvis Hall? Time fades memories!) to catch the bus and buying sweets at Mrs. Atkinson’s shop. I have fond memories of fishing for newts at the Glen pond, picking blackberries that grew wild and roaming around all those unmade roads. Does anyone remember Ted Moore, who lived next door to us? He had an apple orchard in front of his house. Really enjoyed seeing all the pictures and reading people’s comments. Jilly-Ann, the only information we have about Durley Grange is the name of the owners of the property. Having checked in the 1918 and 1929 electoral registers it seems likely that your grandmother’s employers were Walter Cammack and his wife Florence Artuleas Cammack, who are noted as living at ‘Durley Grange’ Fernlea Road. The Cammack’s were an important family in Benfleet at that time, owning quite a lot of land and they played a big part in village life. They were keen members of Benfleet Horticultural Society (formerly South Benfleet Food Producers Association) having been members since its formation. According to The London Gazette dated 15th July 1960, the property Durley Grange, and all its surrounding land was sold to a property developer. 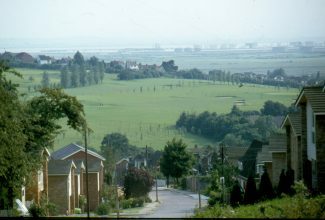 Subsequently many houses were built and the area has since been known as the Durley Grange Development. My grandmother Ethel Mott worked at Durley Grange, South Benfleet. She worked as a General Domestic Servant there around 1915. Any information will be interesting. A lovely insight to the past, Eileen. Appleton House, now that is an interesting building. I understood when I was a child in the 1950/60s, it was as old as Jarvis Hall in part. When I was at King John School, I remember going past one morning and saw a starling caught on a branch in their garden. I knocked on the door and they let me in to untangle it. It was just a baby and had some cotton tangled around its leg and the branch of, I think, an apple tree. I took my penknife, everyone had one in those days, out of my pocket and cut the cotton and let it go, for which I was thanked. There was usually a Heinkel or Meschersmit 3 wheeler parked outside there in those days, either by the Laurel hedge or the brick wall. I think the partly fenced field you mention above, where you used to chase butterflies with you friend Susan, was a glorious playground. I used to pick buckets full of Dandelion Heads every summer (had to be in the full sun) for my grandmother, who lived in Addiscombe, Thundersley Park Road, to make Dandelion Wine from. I also used to fish for newts in a very small pond off the edge, down the slope, at the bottom corner, next to Thundersley Park Road. It was covered in floating Duckweed every summer. Probably a remnant of the ponds made by the Romans to extract clay for Bricks and tiles? There is now a property built on that plot, right where the pond was. Unlucky for someone, I bet they don’t know why their garden (or even their walls are so wet). All the woods, although very dense, were full of fruit trees. This continued down into Thundersley Park Road and in our own garden, which was ‘The Chimes’, not to be confused with ‘Chimes’ in Hill Road, we had two massive pear trees, many apple trees and a whole hedge of Bullous. The same applied to Granville opposite. All the fruit was very old and old breeds too. In the front of Granville was a large lake, partially surrounded by big Horse Chestnut (Conker) trees. This was filled in when King John School was built in the 1940s I think or possibly before? With the spoil from the footings during the construction. The water which used to run in to the lake, which was drainage from the woods and the piggery, which was built later, used to subsequently continually run from a pipe in the wall into a ditch alongside Thundersley Park Road. This later caused a lot of flooding in the houses built in the grounds of Granville, for of course ‘Unknown Reasons’. There was often geese in those days, roaming in the field opposite the bungalow in Thundersley Park Road, which is also, probably the one you mention, where the man was always gardening. They kept a lot of chickens on that plot too. It had a sort of allotment next to the bungalow and below where the field next to Jarvis Hall and Appleton House were. We used to call that field the Hay field, because it was cut for hay, early every summer. If we were lucky the guy who collected it would give us a broken bale or two for my rabbits. Does anyone have information on the history or pictures of Appleton House at the top of Thundersley Park Road, on the corner of Glen Road, next door to Jarvis Hall? I remember Susan Lambert, although she was a bit older than me and I used to go riding on Goblin as did my sister when we were young. Actually I am sure that the grocers shop opposite Wards was called (R.E.) Knott both Mr & Mrs Knott were not English, the shop assistant was always called “Jordy” which I presume was short for Jordan but the shop was owned by the Mr & Mrs Knott. I used to have my hair cut sometimes on the male side of Wards. Then off to Skipper Wyatts on the corner of Richmond Avenue or Galloways for some sweets. When I was a bit older I would spend my pocket money at Croisettes on pop records, my first being Cilla Black “Anyone who had a heart”. I drove my family mad with that. Later I ‘fell in love” with Janice Croisette until I left school in 1965. I remember Durley Grange well. I was born in Underhill Road in 1947 and my mother and I often walked round to see them and get some eggs. They had an alsatian called ‘Carlo’ and he would take himself off to our bungalow for a drink on many occasions and jumped our gate to get in. I also remember Raymond (their son) who was a builder. I remember him getting married and then having a baby. However, sadly Raymond died of cancer not long after his daughter was born. I remember Pam Bannister and her horses and there used to be a field just inside the Glen at the top of Underhill Road, where another lady called ‘Pat’ who lived nearly opposite Pam kept her horses ‘Goblin’ and ‘Falcon’. I lived in Underhill Road for 21 yrs and remember many families. Although my name was Lambert my mother’s family name was ‘Nevill’ and have a long history with South Benfleet. My grandmother played the piano in the village hall for the ballet classes and my mother and her brother ‘Bertie Nevill’ were very well known in the village, as it was then. I can remember having my hair cut by Mrs. Ward on The Parade and the grocers shop opposite known as ‘Jordans’. How great to see the photos of Hill Road. My parents built a bungalow at the bottom right hand side of Hill Road in about 1957/58, they called the bungalow Evaron (a combination of their names). It was opposite the stables where Pam Bannister kept her horses, she lived with her parents in the first house on the left at the junction of Hill Road and Underhill Road. I used to toddle across there when I was very young, inevitably I ended up with a pony of my own. I’ve inherited some very fragile cine film of myself on the pony being led by my Dad, I think it was on the piggery. There were no pigs there then so it must have been the early 60’s? When I was older I used to ride all the way up the hill to the London Road and I remember your house, opposite what we called the Triangle field. I was friends for a while with the girl who lived at Jarvis Hall, I think she was called Fay. it was such a safe place to grow up, like you I can remember playing outside and roaming the area until dark. Happy days!! It’s funny how after a slight dig in the memory just how much you can recall. The last time I can remember seeing you, you were in a pram outside your mum’s back door, you had been eating an orange and was stung on your mouth by a wasp…..and how loud can you scream!!! Thanks for your comments Robert. We must have been near neighbours for many years. Tell me, do you remember a family called the Allerman’s? They lived fairly near the top of Hill Road on the left-hand side as you go up the hill. I believe they owned quite a lot of land. Also, on this site we have a picture of a property that once stood in Fernlea Road. If you look under the heading ‘places’ and then pick ‘Gamekeepers Cottage’ you will be able to view this. We have no information at all about this property, do you know anything about it? Lastly, yes I do remember the Hall’s who lived in Avenue Road. I think my father knew them too, he used to walk his dog every day, taking in Avenue Road in his circular tour. Most of the photos on this article were taken by him, some during his daily walks. No I am afraid that I didn’t know the Allermans. I really didn’t venture up Hill Road beyond the junction of Fernlea Road. Although working as a paper boy for Lesters in Kiln Road, I used to deliver newspapers to the ‘piggery’, that would have been around 1964/65. I also delivered to the one bungalow in Lime Road at the Mount Road end (it appeared that there was not a connection between the two ends of Lime Road). If I am right, The Gamekeepers Cottage was the only house in the section of Fernlea Road between Avenue Road and Mount Road, but memory is hazy on this score. I wonder if it really was a gamekeepers home? I went to the primary/junior school on the High Road and later to King John. I used to walk to King John through the Glen when the weather permitted. I guess that though near neigbours our paths never crossed Eileen. I lived in Underhill Road from 1952. I remember visiting Durley Grange many times as a child as my father was in partnership with Ray Bakewell, who I presume was the son-in-law of the owners but I am not sure here. Ray’s wife was named Beryl. Ray and my father built several of the bungalows in Avenue Rd, and Fernlea Rd together with a house opposite Durley Grange which was later named King’s Bounty. These properties were built from around 1957 onwards. I can’t remember all the names of the occupants but there was Mr & Mrs Hall in Avenue Road, and The Cousins & Thompsons in Fernlea Road. Some of these have now been demolished and re-developed.